May 28, 2012 – As we pause today to honor the soldiers who gave their lives in defense of this country, we at the Never to Yield Foundation want to pay special tribute to the thousands of Auburn men and women who serve and have served. The debt we all owe to these brave men and women cannot be repaid. It is through their sacrifice that we have the freedom and leisure to worry about things as ultimately insignificant as football, baseball, basketball, golf, tennis, soccer and all the other games that are our passions. On this day that we honor the troops who serve us, the little-known story of a great Auburn man and honored member of the American Armed Forces deserves to be retold. If there were a Mount Rushmore of Auburn football, Ralph “Shug” Jordan’s visage would be the first carved into stone. In his 25 years as Auburn head coach he won a national championship, mentored numerous All Americans, won 176 games and epitomized the ideal of the Auburn man. The Auburn Tigers today play in a stadium that bears his name. But before Jordan became an Auburn icon, he was a decorated member of the United States Army serving during World War II. When the United States entered World War II, Jordan reactivated his military commission in the U.S. Army Corps of Engineers as a lieutenant. He was assigned to the First Engineer Special Brigade, an amphibious assault force. Jordan saw action in every major campaign in which the army was involved. He participated in invasions of North Africa and Sicily. At Normandy, Jordan’s courage earned him a Bronze Star. Injuries from shrapnel at Omaha Beach earned him a Purple Heart. After recovery he returned to action at Okinawa. Jordan resigned his commission in 1945 having achieved the rank of major. He returned to Auburn that same year where he took over as basketball coach. After a dispute over veterans like Jordan being allowed to return to the coaching staff, Jordan left Auburn. Five years later, athletic director Jeff Beard brought Jordan back home and he took over the Tiger football program in 1951. The rest is Auburn history. Jordan’s accomplishments as Tiger head coach made him an icon. His gentlemanly demeanor and spirit of sportsmanship defined the concept of what an Auburn man should be. He is revered by generations of Auburn fans for his impact on the program and the legacy he left. On this day it’s worth remembering that Jordan was an American hero before he became an Auburn legend. May god bless all those who serve our country with valor and honor. Not a great football fan, but interested in this. Many thanks to our hero, Coach Jordan and War Eagle Forever!!! Not long before he passed on, I saw Coach Jordan in the Old Kystal on Magnolia, I walked up to him and said Thank You Coach, he patted me on the back and said My Pleasure. I will never forget that meeting. That is so great to know but if you listen to sports radio in Birmingham you would have to believe that only Alabama alumni served in the Arm forces and saved our country. 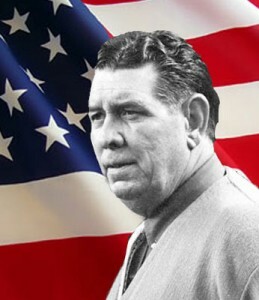 Coach Jordan was a great Auburn man, maybe it was his influence that caused me to be a Auburn fan.WAR DAMN EAGLE!!!! !